When you are talking to a fool, it is like talking to a brick wall. Why even bother? 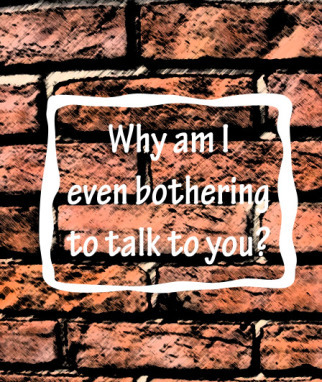 If talking to someone is like talking to a brick wall, the person you are speaking to does not listen. Our verse today explains to us that even when a fool is put under pressure, the foolishness inside them will remain. A mortar was a cup-shaped stone vessel that held grain, so it could be pulverized with a pestle, a club-like instrument used to pound the grain. Braying the grain meant to beat, bruise, and crush it to powder. The metaphor is powerful! If you were to smash a fool in a mortar with a pestle, you could not drive away his foolishness and make him wise. Lord, I pray that I will fear you more and more each and every day. I want wisdom to be my present and my future. I don’t want the Lord to see my life and say that it was like talking to a brick wall when He was speaking to me. This entry was posted on Saturday, November 9th, 2013 at 8:10 pm	and tagged with beat, bruise, crush, foolishness, grain, mortar, proverbs, vessel, Wisdom and posted in Fools, Wisdom. You can follow any responses to this entry through the RSS 2.0 feed.